I totally did not plan to read these books sequentially, but they happen to complement each other perfectly. Everyone online seems to be talking The Ones We Choose and when I read the first part of the description—"Lisa Genova meets 23 and me," I was instantly sold. I love all of Lisa Genova's novels, and her writing has definitely been an inspiration for my own stories. I've also had a lifelong fascination with genetics, so this debut from Julie Clark seemed tailor made for me. And the absolutely stunning cover didn't hurt either. The story inside the cover is touching, genuine and real. I loved getting to know Paige and her son Miles who was conceived via a sperm donor. Everything is going relatively smoothly in this non traditional family until things begin to get serious between Paige and her boyfriend, Liam. Miles makes his discomfort quite clear, and the situation pushes him to question the identity of his father and where he really came from. Paige works as a geneticist and when she learns that her son may have inherited a serious genetic disorder, she is faced with a difficult moral choice. Because the characters are so real and well-developed, I was willing to accept a few some random coincidences. I loved and I rooted for all of the characters every step of the way. This story explores universal themes—the meaning of family, what it means to be related, the importance of nature versus nurture—deftly and with a light touch. I thoroughly enjoyed this story and I will keep an eye out for what Clark writes next. 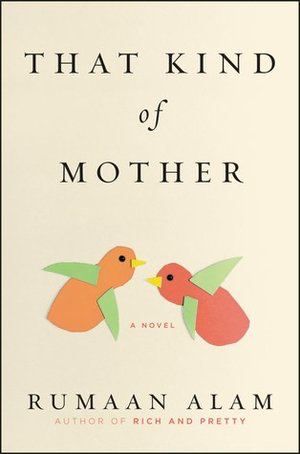 The second book in the pairing is That Kind of Mother by Rumaan Alam. I really enjoyed his debut novel, Rich and Pretty, which came out in 2016, and the description of his latest novel sounded fascinating. After white woman in her early thirties has her first baby, she forms an instant bond with Priscilla, the African-American lactational consultant at the hospital. When she asks Priscilla to work privately for her as their nanny, their relationship deepens and Rebecca becomes heavily dependent on Priscilla to help her care for her son and for their whole family. When Priscilla dies during childbirth, Rebecca makes a spur of the moment decision to assume responsibility for Priscilla's baby. As one might expect, the road forward is not an easy one for Rebecca, her husband, their children or for Priscilla's remaining family. The book raises important questions about race, belonging, adoption, and the meaning of family. Both of these stories center on non-traditional families and the challenges both parents and children face when their families look different than the "typical family." In the twenty first century, families can take any form, and these stories remind us that the most important thing is not the number of parents, the gender of the parents, or the color of the children, but the fact that the children are loved, cherished, and taught to be kind and tolerant human beings.